Ooh. By the ending of Between the Lines I was absolutely desperate to find out what would happen next. So when a copy of Where You Are by Tammara Webber, the second book in this series about young actors and actresses landed on my doorstep I was beyond excited. And I just had to read it straight away to find out about my two favourite characters! The first thing that I loved about this book is that it's told partially from Graham's perspective. With Between the Lines we were really only partial to what Emma and Reid were doing and feeling. I really wanted to know what was going on with Graham. And Where You Are gives this to us in spades. I love the intensity of his feelings for Emma but also finding out more about his Baby-Mama and what happened there and also about Graham's previous and ongoing friendship with Brooke. 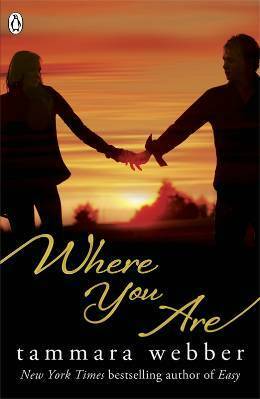 Where You Are feels very much like Graham and Brooke's story. While we do have the perspectives of both Emma and Reid here as well, the story still belongs mostly to Graham and Brooke. With Graham, we see him worrying that Emma and his burgeoning relationship is getting too serious too quickly and he's already been burned in love before with his ex, Zoe. While he wants more with Emma he knows that she isn't as experienced and he wants to know for sure that everything is behind Emma in terms of her previous relationship with Reid so that they can go forward with things. And with Brooke, she's harbouring this strong belief that Graham and her belong together. They've been friends for years and sharing huge and important secrets together has bonded them in a way that Brooke really values. She's sure that with Reid's help, she can break up Emma and Graham so that she can have her shot with the man of her dreams, finally. So Brooke and Reid set out to destroy this fragile new relationship. It was pretty gruesome to watch. Especially as Brooke is the mastermind here and she really plays on Graham and Emma's insecurities, jealousies and their distance to plant seeds of doubt into both Emma and Graham's minds. I was impressed with the way Brooke's mind works with her scheming plan. She's manipulative and ruthless and she throws everything she has into this. I did feel a bit sorry for her but not in the way that I sympathise with Reid. There doesn't seem to be enough there to redeem her in my eyes. We'll see though. I do love Graham and Emma, both separately as characters and also together. They're very sweet and their feelings for each other are very obvious and at times incredibly sappy. I was rooting for them throughout and I really enjoyed witnessing the early stages of their relationships. Being all cheesy with each other over Skype and with the whole not being able to take their eyes or hands off each other. These two are insanely cute together. And, as with the first book in the series, I found Reid to be a fascinating character. He can be such a jackass through so many different things but he's anything but predictable and there are moments in this book where Reid surprises me by his actions. I want more for Reid. Bring on the third book in the series! I like the sound of this - thanks for the review! I didn't read most of your review because I haven't read this series yet - thanks for the spoiler warning ;) I read Easy by Tammara Webber and really enjoyed it so I'm hoping to read Between the Lines soon. I love, love, LOVED Easy. So much. Which is why I was so excited to pick up this series. And while these books are very different they're still very romantic and fun. Love this series.